So I'm more than willing to admit that I'm going insane. I just need to put that out there, up-front and so on. But I'm having a crisis of faith in preamps. I have a pair of Neve 1272's (modified by Brent Averill.) I liked them better than the old 1073 I had (I know, let's just list this as apostasy #1). But although I've gotten some great guitar sounds with them, I've really started to prefer the Lindell preamps. So, I figure, maybe as I've gotten older I've been feeling more API than Neve. That's fine. 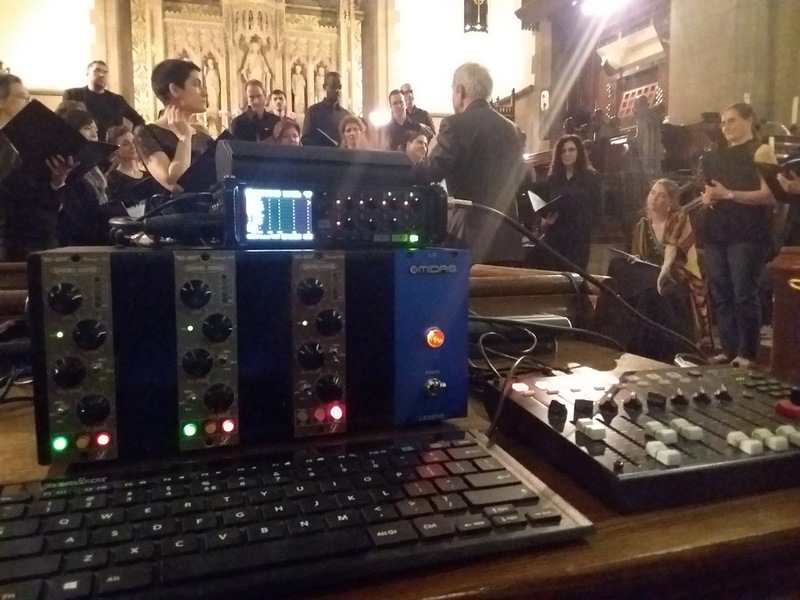 So the other night I was recording Russian Chamber Chorus with my Zoom F8 and I figured I would use Lindell preamps. Because, you know, more better, right? No. No, not at all. There at the time I hated the sound of the Lindells on this ensemble. Hated. Let's review. I have a custom ribbon microphone in the air above the conductor, and a pair of spaced Oktava 012's with hypercardioid capsules in the sweet spot in the audience where we get a "bloom" of the sound. There's also a backup microphone on that stand with the ribbon. Oh, and the ribbon has a cloudlifter on it. 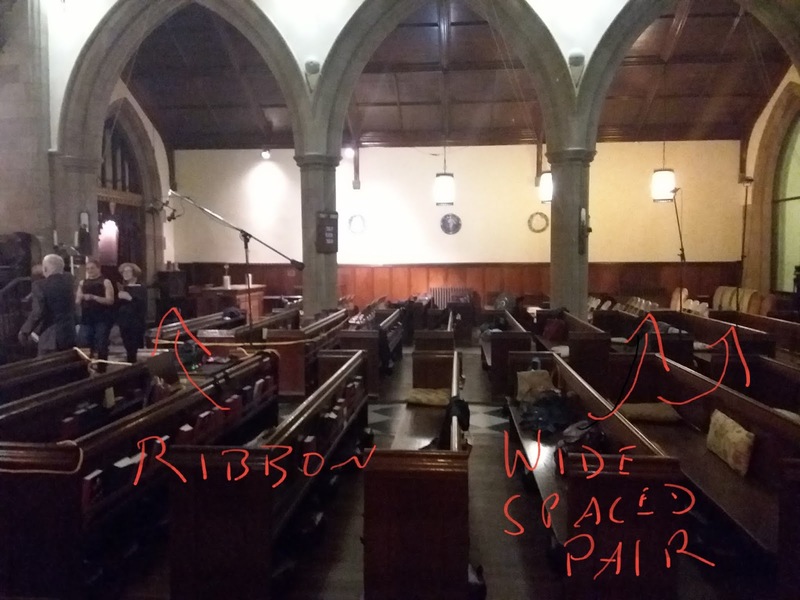 Now while I was recording it was immediately and imminently obvious that the Lindells were not as detailed and nice for this material. Counter-intuitively, however, when I got home I couldn't tell the difference between the Lindells and the internal preamps on the F8. Which is odd because you'd expect that differences would be more apparent listening on Sennheiser HD 600's or my Blue Sky system. So why how what wut? How could something be so obvious in the field but not under more controlled conditions? Well, on location I'm using lower impedance headphones -- Sennheiser HD 280's. And the F8 does not have the world's best headphone amp. So at first I thought that maybe the TRS line inputs took a different path for monitoring off the F8. That doesn't seem to be the case. Maybe it's because of the phase relationship between the line inputs and the mic inputs and the actual sound which was bleeding into my headphones from the actual singers? But in either case, the F8's preamps are very tres excellent for classical music. Does this mean I should just get rid of the Lindells? Well, maybe not. Maybe for rock and roll the API-like sound of the Lindells is better. What I noticed was there was less "air" and less detail. But for a fat blues guitar, that might be just the ticket. I don't know. I do know, however, that the Neve's which I'm not using probably need to go to someone who will love and make records with them. Because I'm not. So today I recorded RCCNY with a pair of ART Pro MPA II tube preamps. In the field I could not tell the difference between the ART's and the internal preamps to the F8. So I figured "At first, do no harm" and recorded the concert with the ART's. Listening back to the rehearsals where I was switching between the ART's and the internals can I hear a difference? Uh. Maybe? It's not a big one. And it's certainly under the threshold of placebo effect. So I'm not super into lugging the ART around. For classical music it seems that the internal preamps to the F8 are more than fine. But wait. That's not all. 2.6kHz. It drives me nuts. Wait 'till next time. Faith. And a new faith.